Heat 2 tablespoons of the oil in a large non-stick frying pan over high heat. Add the ginger and garlic, and cook for 1–2 minutes or until lightly golden. Add the quinoa and cook, stirring occasionally, for 10–12 minutes, or until lightly toasted. Add the onion and soy sauce and toss to combine. While the quinoa mixture is cooking, heat the remaining oil in a medium non-stick frying pan over high heat. Cook the salmon for 3–4 minutes each side or until cooked to your liking. 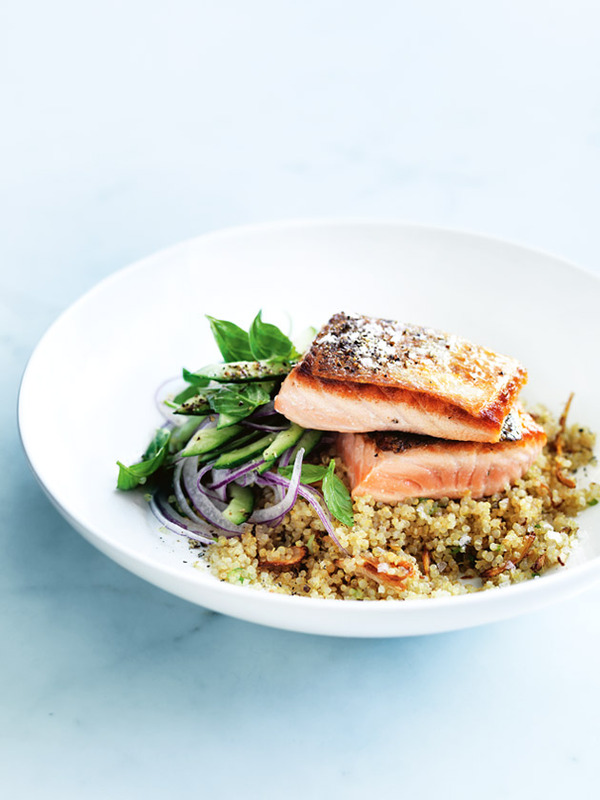 Divide the quinoa and salmon between plates and sprinkle with salt and pepper. Serve with the cucumber, red onion, basil and lime. Serves 4.